What Is RIE Parenting And Is There Any Value In It? Seeme & Liz > General Parenting Tips > What Is RIE Parenting And Is There Any Value In It? What exactly is RIE parenting? It is a parenting style that as of very recently I hadn’t heard of. Friends often ask me about parenting tips (because of my background working with children of all ages and abilities) and recently a friend asked me about RIE parenting. I was stumped. I had actually never heard of it before. So I did a little research and will share my findings and thoughts with you here. RIE (pronounced “wry”) stands for Resources for Infant Educarers. From my research into this topic I learned that some people claim that RIE is a trendy parenting style touted by celebrities such as Tobey Maguire, Penelope Cruz, Helen Hunt and a few others. An example of this can be seen in an article in Vanity Fair (February 2014). However, much to my surprise RIE has been around since 1978, so it definitely does not sound like a trend or fad. RIE was founded by Magda Gerber who was an early childhood educator in Hungary. Gerber worked closely with pediatrician Emmi Piklyer and pediatric neurologist Tom Forrest. Gerber came up with RIE through her own parenting experience as well as through her work as an early childhood educator. The premise of RIE is RESPECT. That is, respecting your child (even infant) as a capable human being and not simply as an object. To understand RIE a bit better lets look at some of its basic principles. As I mentioned above, this is the underlying key to the RIE approach or philosophy. This should be the guiding principle for all parents. We should always respect our children if we want them to respect others. This is a child who feels competent, independent and secure in their environment. This goes for infants, toddlers and children. View them as competent individuals. Through observation, we can learn a lot about our children and their abilities. By taking a step back and observing, a learning environment can be created. Allow the child to explore without being told “no” too many times. Babies learn best when their environment is predictable. This doesn’t mean removing your house of all potential dangers. However, a good idea would be to find a room or area of the house that can be designated as “baby safe”. This is the room/area where you won’t have to say no to everything your baby wants to explore. Instead of always trying to “teach” a baby/child, appreciate what they are naturally able to do. Encourage your little one’s inquisitive nature by following their lead! This can range from diaper changes, dressing, mealtime, etc. For babies this can mean narrating what you are doing, rather than just going about your activities as if the child isn’t present. For example, saying something like “now we are going to change your diaper. I will get a clean diaper and put it on you…”. Set limits and make those limits known. This is how to develop positive discipline. 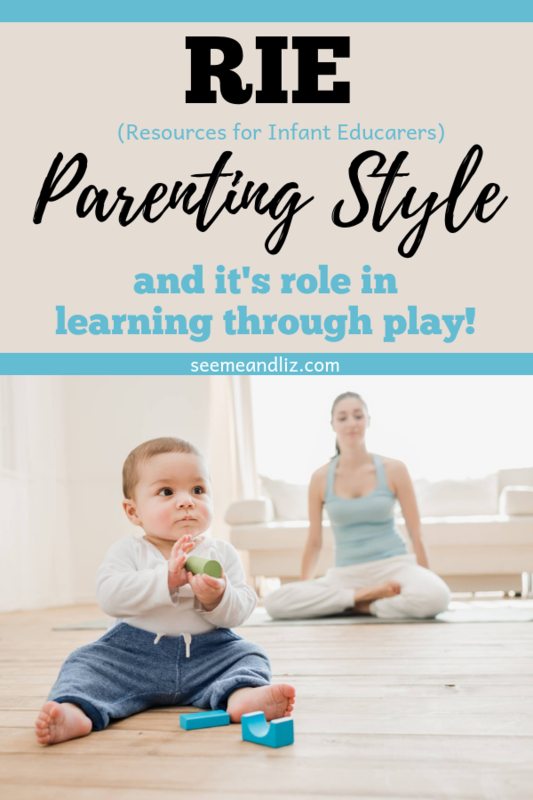 Now let’s take a look at some of the pros and cons of the RIE parenting style with respect to the idea that children learn best through play. Principles 4, 6, 7 and 8 stand out the most to me when it comes to children learning best through play. These RIE principles encourage a baby/child to play freely in a safe environment with the parent taking a step back. RIE philosophy urges parents to allow their child plenty of free play time or unstructured play and use only simple toys or household objects (that are deemed safe for a young child) as opposed to toys with lights and sounds. I wholeheartedly agree with this as well! When a child is given a toy with buttons that cause lights to turn on or music/sounds to start playing, that is all that toy will be used for. It can teach cause and effect – maybe some labeling of animals/objects – but that is about it. It does not allow for much open ended play, especially for young children. For babies, simplicity is often the key. Loud and bright toys can cause over-stimulation in some babies. RIE also advocates for a lot of distraction free time between parent/caregiver and child. RIE educarers want you to remove phones, TV’s, tablets, etc. so you can spend quality time with your child. Again, I agree with this one! Our world is including more and more technology everyday and it is available for infants, children and adults. However, many studies will prove that this is not the ideal way to promote learning in a developing and impressionable child. Of course I am not saying that you should get rid of all technology in your house and live in the dark ages. However, make sure to set aside “tech free” times with your children. This means no TV on in the background (even if you think it’s being ignored). RIE educarers also advise that “baby talk” should be avoided at all times because this is not treating the child with respect. Rather, you should talk to your child the way you would another adult. I agree with this somewhat and you can read more about my perspective on this and why I feel it is important for your child’s language learning abilities by reading the article Stop The Baby Talk – Or Should You? The RIE principles are viewed as too rigid for some parents, especially those who lean more toward an attachment style of parenting. Some examples of this rigidity include not allowing your baby items which are seen as demeaning. For example, infants should not have high chairs, soothers, bottles, sippy cups, blankies, baby wearing, etc. There is no need for these items as they believe a child, even a baby, can be taught to drink from a cup and self soothe for example. Babies are not small adults, they are not as developed. They still have primitive reflexes. I do however believe that soothers and sippy cups should only be used in the first year, maybe second (for sippy cups), of life. Most one year old’s are capable of drinking from a straw and often soothers are used as a parental aid to silence a crying baby/toddler (sorry if you disagree with me on this one – but I was guilty of using this technique on occassion). RIE guidelines also recommend that you let your baby cry and not always jump to their rescue. This is why the above items are considered a “no-no” in RIE. They are seen as crutches. RIE advocates state that crying is natural and items like soothers are shoved into a babies mouth because it is the adult who doesn’t want to hear the child crying. Some of these ideas are a bit harsh in my opinion. While it may be natural for a baby to cry, they also need to know that an adult is there to comfort and protect them. The world and all of it’s unknowns can be a scary place for a baby/child and they need reassurances from the people they trust. Most of the cons do not relate to learning through play; however, I feel that they need to be mentioned. I also do not agree with the idea that children do not need any toys, or very minimal and modest toys. Sure, the toy market is a bit excessive these days, but there are many high quality educational toys on the market that can and will help your child learn. Your child does not need every latest and greatest toy out there, so make sure you are being selective in what you purchase to get the most for your money. After completing my research on RIE parenting, I’ve come to realize that I have actually been practicing some of the RIE principles with my own children without knowing it. I always narrated to my children when they were babies and I made sure not to use too much baby talk. I know that other parents do this as well. Telling your child what you are doing when they can’t speak with you just seems natural. I also let my children cry a bit (I know many will disagree with this) especially when they were babies (not newborns). I wanted them to learn to self soothe but I also wanted them to know that I was there for them. We also don’t have a toy room packed to the ceiling. I am selective in the toys my children have. They do not need everything. I also encourage unstructured free play every single day! And we have no screen days (1-2 a week) and from time to time we implement a no video game, YouTube etc. week (they get to watch a few nature and science shows on Netflix). Parent’s should not feel like they need to follow a particular parenting style. Take what works for you from each one and then tweak it even further to make it your own. It will also depend on your personality as the parent. RIE is not for everyone, however I do believe that many of the ideas behind it make a lot of sense. For more information check out the book Baby Knows Best which outlines the RIE philosophy. It is written by Deborah Solomon, RIE’s current director. Or check out RIE’s official website at rie.org. What are your thoughts on RIE? Have you heard of it? Do you believe in their philosophy? Please share your thoughts in the comments below! As the parent of a 2 year old, I found this article to be very interesting. RIE is very different from my upbringing as well as what I used with my first child. In fact its very different. I am going to try some of the RIE principles over the next few months and see what difference it makes with my daughter. There are so many different parenting approaches and styles. I prefer to pick the best of a few and use those with my children. Good luck giving some of the RIE principles a try with your daughter! As I read your article I understand that some of the RIE principles are very standard and basic rules that don’t apply to a specific educational practice. Some things are a given so it is natural for RIE to follow also but for some specific rules I think there is no right or wrong. Some people may agree while other don’t. I think growing children is not black and white and there is no clear right or wrong way. As each child is different as such our techniques should be elastic and be able to adapt depending on their character and behavior. Thanks for your comment Stratos. I agree, parenting is not black and white. It’s best to try and stick with what works best for you and your children. 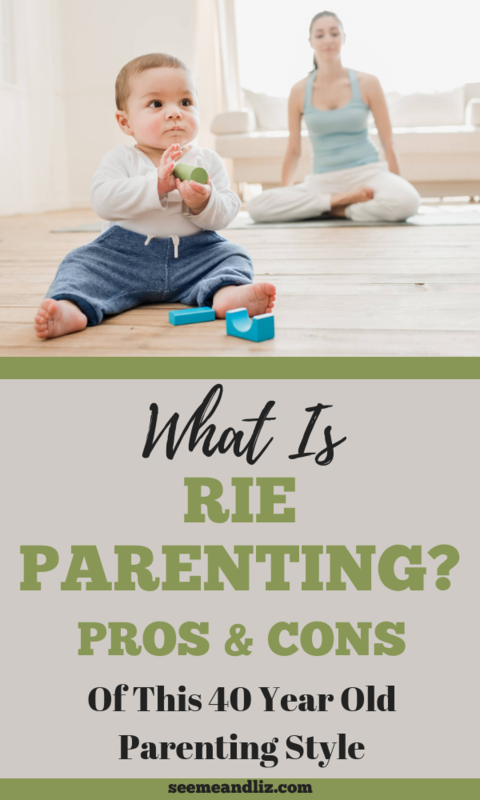 I have never heard of RIE before either and I have explored many different parenting methods as a parent myself. One thing I have learnt from being a mother is that kids don’t do well with screens. I used to allow my kids a few hours a week of screen time and every time there were tantrums after it. They also used to nag for it A LOT. Now they know the rules, they are allowed screen time only when I give haircuts and when we travel. The tantrums have gone and they play better. I don’t agree with the point of no baby items- my baby is a baby, she needs things that are specially for her. My kids all had dummies until 3, and then threw it away themselves. Not ideal but that’s when they were mature enough to understand what they were doing and its worked perfectly for 3 kids so far! My parenting method is to take a bit from each one and make my own! It works for me and my kids are happy so I guess thats a win-win! I agree that kids and screens do not always mix well. Especially for very young children (ages 6 and under). I also follow your parenting method where I take tips and strategies from various parenting approaches. There isn’t one perfect way and a lot of parenting is learned through trial and error. The most important thing we can do as parents is to be observant and figure out what works and what doesn’t and then make the necessary changes. I never knew about it, but I think using this method can really help educating your children in the right way. I will discuss this with my wife, we both want a strict education for our kids and I can see how the RIE style of parenting can help with this. Thanks a lot for sharing it, this will help a lot of people with raising their children. I agree that the RIE parenting style has many benefits for a child’s development. But I am not sure what you mean by wanting a strict education for your kids? Remember, children learn best through exploration and child led play/activities. There is plenty of time for education later! But the foundation skills must be in place first. You can read more about this here. The whole idea of RIE, resources for infant educators, is new to me. But I can see why this strategy is touted as one of the most effective infant education system. Although my kids are all grown now, had i been aware of RIE, I believe I would have given my children a better start in life. For instance, the 8 basics principles of RIE would have come in handy. Or perhaps I can still apply them even now since these principles look like they could help anyone, no matter what stage in life they may be in at the moment. Yes, RIE does have some good points that I think all parents can benefit from. However, as I mentioned in the article I don’t think parents should rely on any one style of parenting. I’ve never heard of this RIE parenting before, after reading your post, I think this is a great style of parenting. I always believe in letting others do what they want and I think it helps you develop self-worth and self-confidence. It may also be due to the way I was raised, I was taught too much about how not to do this and that and I think it’s just not as good. All in all though, I think it’s more about being there for your kid and accept them. Parenting styles are interesting but as you mentioned, Ithink rigidly following it is not a good idea either. You mentioned you’ve used some of the RIE techniques, I am curious to know what are some results you’ve noticed? There are so many parenting styles out there and I think each one brings some good techniques with it. I tend to follow some of the RIE principles such as “respect”, “observation”, “trusting in the child’s abilities”, “allow the child uninterrupted play and exploration” and “involve the child in daily activities”. I find that my children are very creative and love exploring. I have always encouraged this. When they get bored, they head to the recycle bin and come up with some pretty creative projects using recycled objects, tape, glue, staples, etc. I am also a strong believer in trusting a child’s abilities. I always encourage my children to try something even if it is hard at first.